Criffel Lodge (Kirkcudbright ) - This Scandinavian style lodge is the perfect tranquil location for a visit to Dumfries and Galloway. 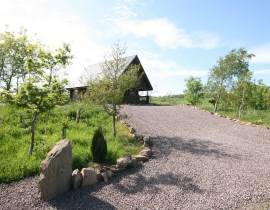 Set on the edge of a nine hole golf course and driving range, overlooking the River Dee near Tongland, there is a Golf Club house with a restaurant, and children are especially welcome. The lodge is surrounded by farmland, home to the famous Belted Galloway cattle which can be handled or photographed.